Cravendale has brought out a new integrated campaign promoting the milk brand, Cats with Thumbs. The television commercial at the centre of the campaign brings to life a man’s mental flight of fancy as he muses on what might happen if cats were to grow opposable thumbs. The spot stars a number of polydactyl cats preparing themselves to try to get to the Cravendale milk they so love. 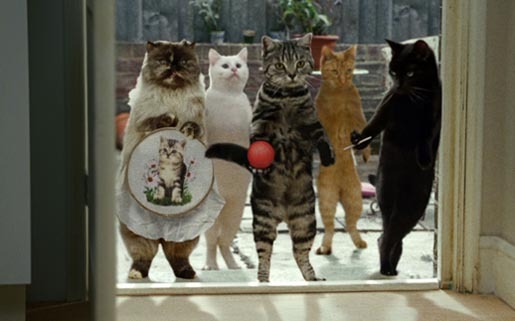 The cats perform a range of human-like tasks with their evolved thumbs – they file their claws, knit, read [The Art of Military Strategy] and click their fingers, West Side Story-style, all to a track reminiscent of Inception. The campaign is online at Cravendale Milk Matters, with connection to the Wikipedia entry for Polydactyl cats, Bertrum Thumbcat’s Facebook page and Twitter page @BertrumThumbcat. The Thumbcat campaign was developed at Wieden+Kennedy London by creative directors Sam Heath and Chris Groom, creatives Freddie Powell and Hollie Sayers, and agency producer Lucy Russell. Filming was shot by director Ulf Johansson via Smith & Jones Films with director of photography Steve Keith-Roach, producer Philippa Smith, and editor Russell Icke. Post production was done at The Moving Picture Company, London, by producer Josh King, VFX supervisor Kamen Markov, VFX team Heather Goodenough, Michael Gregory, Neil Griffiths, Ryan Hadfield, Kamen Markov, Richard McKeand, Mikael Pettersson, colorist Jean Clement Soret.